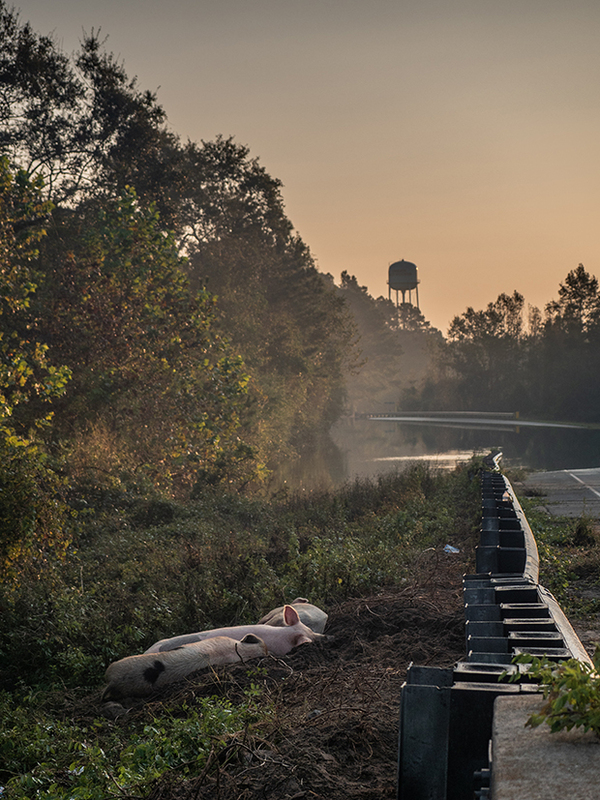 When the filmmaker Kelly Guerin was on the ground in Duplin County, North Carolina, in the wake of Hurricane Florence, she encountered a group of pigs stranded on a highway bridge. It was already getting dark, but she and local activists Daniel Turbert and Caroline Byrd couldn’t leave the pigs behind. After coordinating with local sanctuaries, Guerin and Turbert stayed with the animals all night, counting them, checking that they were still breathing, and waiting for their rescue. 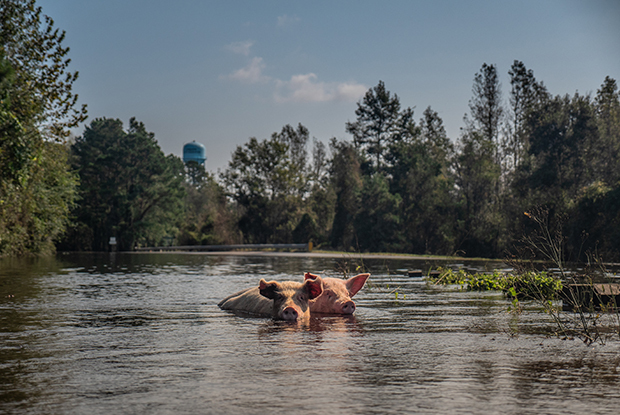 Many of the pigs in the area had never seen the outdoors before Florence; raised for meat, they had spent their lives confined to factory farms, and when the hurricane came, they were been taken by the water. 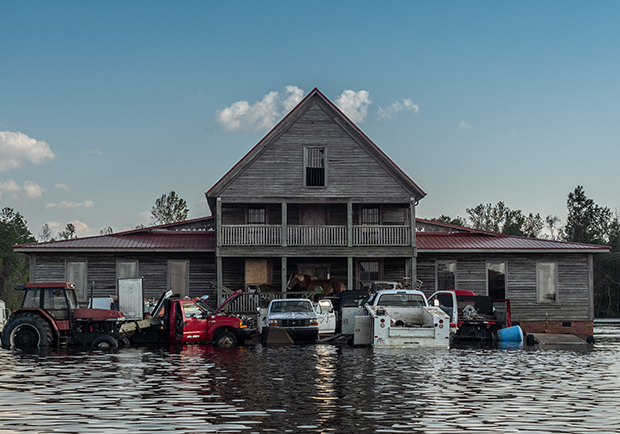 In North Carolina, she and McArthur had their hearts broken and their hopes dashed more than once, but still, they continued to bear witness to what they saw. They weren’t able to rescue these animals, but perhaps their photographs can help others by encouraging us to live more compassionately. I was initially hesitant to ask Guerin about the story of the lost pigs because the wound was still fresh, but she was eager to share it. “Since none of them could be saved in the end, the story is really all we have in our power to bring them some semblance of justice,” she said. I asked her some more questions about the experience. If you’d like to support the We Animals team and their crucial work, you can make a donation here. You can also visit their “How to Help Animals” section here. 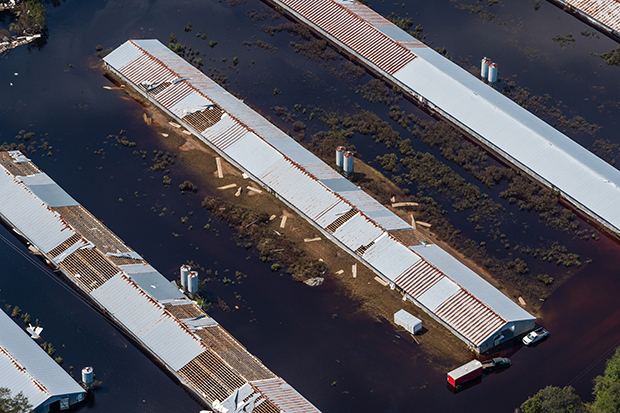 Was anything done to help the farmed animals of North Carolina prior to the hurricane, or were they left completely to fend for themselves? How did some of the animals we see in these photos escape? 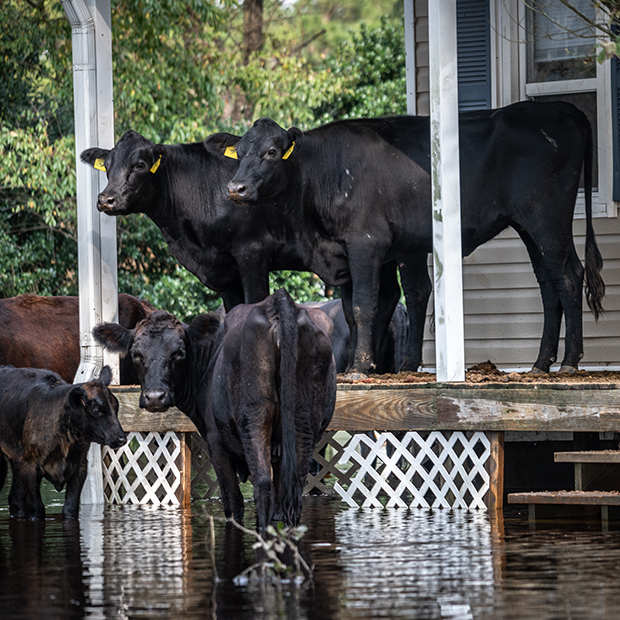 “Some farmers left the doors of their CAFOs (concentrated animal feeding operations) open to give their animals a chance to escape, but we heard from local activists that fewer farmers are making that choice. 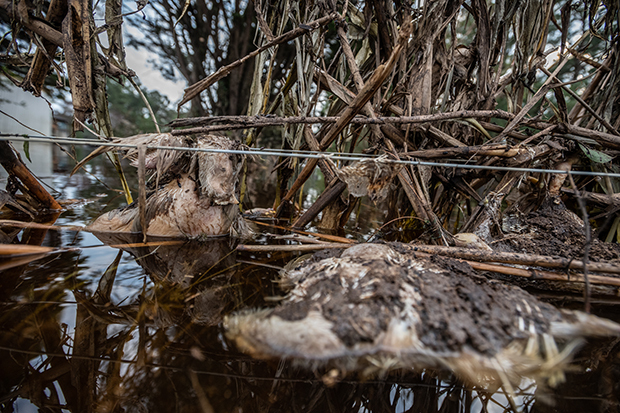 Lost livestock are covered by insurance, but if an animal washes up dead or alive somewhere where it can be seen and photographed, (such as the story of Flo, a pig who was rescued), that sparks a discussion the industry does not want to happen. 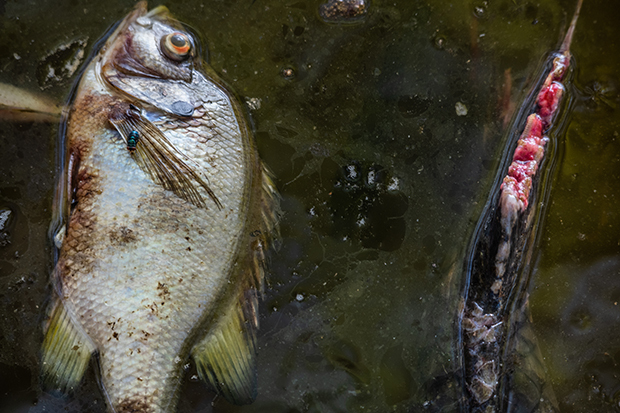 “The experiences of these trapped animals are unimaginable. 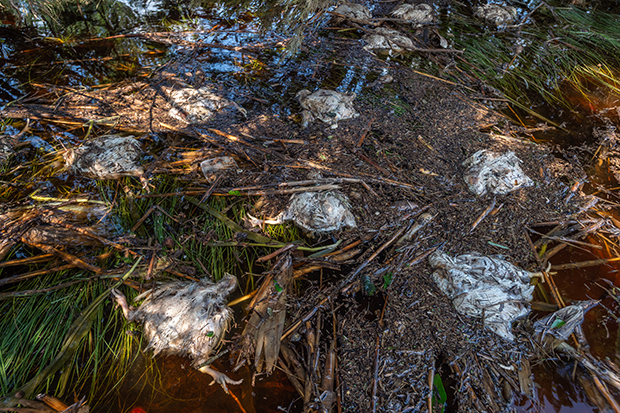 Chickens are physically incapable of swimming and therefore stood no chance of surviving rising waters. 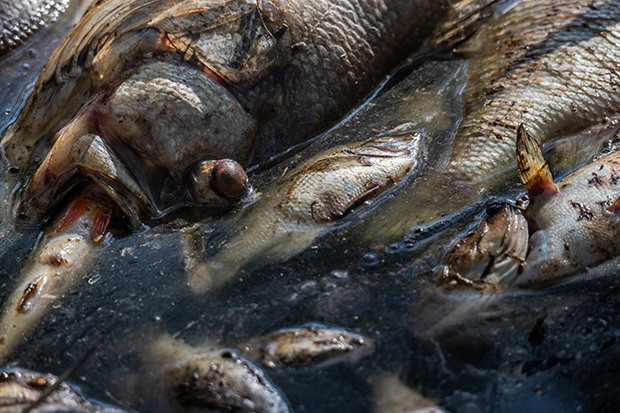 We documented the drowned, bloated bodies of thousands of broiler chickens slowly draining from a cracked door of a CAFO and bodies washed up in residential areas. Do you remember the smell in some of these areas? I know you’ve witnessed the worst of the worst, but was this mission especially difficult for you? “It was. 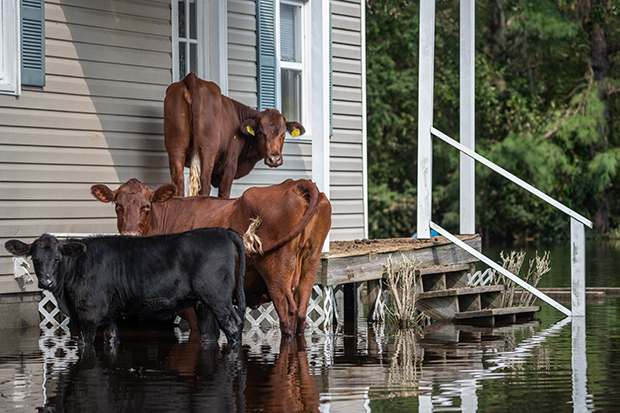 The word that kept coming to mind was ‘apocalyptic.’ Documenting Florence’s aftermath in Duplin County was like stepping into one of those articles about climate change which forewarn the consequences if we do nothing to stop it. Before visiting Duplin, I think there was a part of me that still believed that there had to be a point where we realized, ‘This has gone too far. We’re killing the planet. We’re killing ourselves.’ But that future has already arrived in some parts of the country, and still, we don’t make the connection. 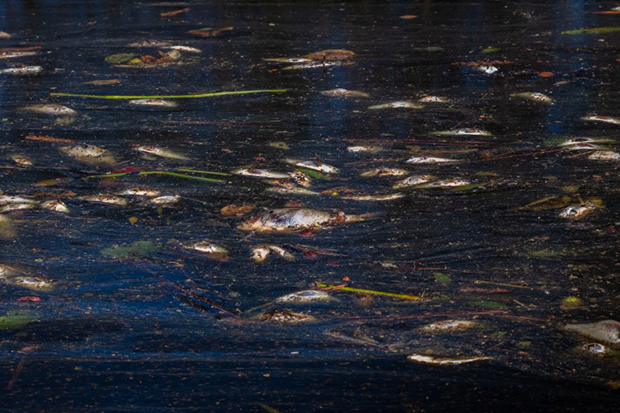 Residents already cannot drink their tap water and suffer debilitating respiratory problems, cancers, and skin conditions from the fumes from manure spray fields. 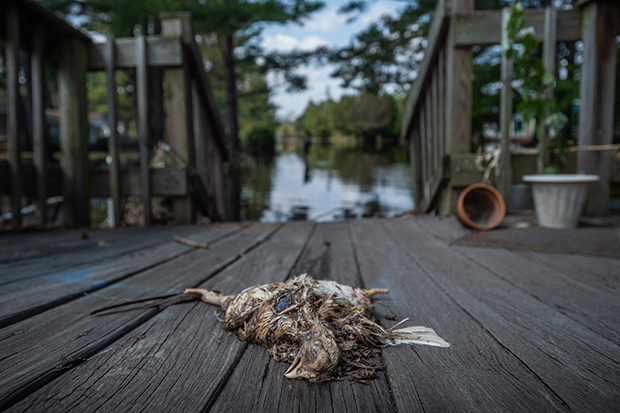 Hurricanes and flooding have repeatedly decimated their homes, killed millions of animals, and washed deadly bacteria and toxic substances into their water supply. Did you speak to any local people about what they were seeing? Does anything give you hope for the future? “Yes, as with any other story that is difficult to document, the light at the end of the tunnel is always seeing the images go out into the world and spark real, informative debate about the issues. It was a sign of changing times to see prominent media outlets going beyond where they’ve dared to go in the past, reporting not only how many animal lives were lost but actually including their photographs in the articles. It felt like a very real shift in journalistic culture to not report solely on the ‘losses’ of the farmers. Instead, we saw angles of climate change, industry negligence, and animal welfare, and the shift in public dialogue that followed was incredible to witness. Hundreds of pictures from the We Animals Archive are available for free to charitable and educational organizations. The project relies on donations from the public. Make a one-time donation here, and if you’re interested in contributing monthly, you can do so here.